Custom calligraphy for weddings, home decor, and more. 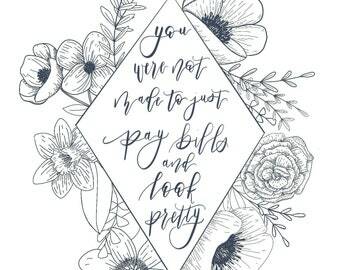 Digital Download: "Don't Just Pay Bills and Look Pretty"
Very cute black and white spring sign arrived quickly and just as pictured. It does not stand on it's own so will need a bowl to hold it...like in the picture. As a writer by day, I have always had a deep love for the written word. When I was planning elements of my wedding in 2014, I couldn't find the contemporary vintage pieces I had envisioned for signage, so I decided to make my own. That sparked a love of calligraphy and hand lettering. I took a few classes, read a ton of books, and have developed my personal style in the years since. I love making beautiful, meaningful pieces that people will treasure for years to come. I'd love to make something special for you! Custom orders are welcome; just send me a message!